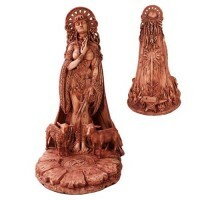 Brigid, the Celtic Goddess of the Hearth holds the sacred flame in this stunning full color altar statue. Locks of red hair cascading down her shoulders. The Cauldron of Creation at her feet. The Sacred Flame, the eternal light of hearth and home, in her hands. A fireplace, the hearth of the home behind her. Books of poetry at her feet. 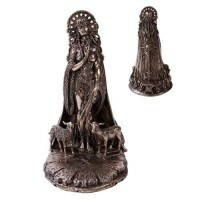 All the symbols of this much loved Celtic Goddess in one beautiful statue. Brigid is Spring, fertility, bringer of Wisdom, Goddess of Wisdom and poetry - a Goddess of Celtic myth rich in detail. 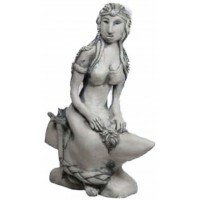 This stunning statue is fitting to honor the Goddess on your altar or a great addition to your Celtic or Mythological collection. Hand painted resin statue is 9 1/4 inches tall. Item Number: UI-WU77090AA | Approximate Size (Inches): 6.50 wide x 5.25 deep x 9.25 high | Approximate Shipping Weight: 3.00 lbs.